Forging and tooling machines are an integral part of manufacturing industry to develop innovative approaches for new tool and tooling system. Automotive industry is a positive influence on the expansion of forging industry across the globe. Every year automotive industry consumes over 60% of forged metals which are produced across the world. Cold forging method is mainly preferred for soft metals such as aluminum. Features such as reliability, high strength, and economic feasibility are increasing the importance of the use of cold forged parts supporting the demand for cold forging machines market across the globe. High quality surface finish and dimensional accuracy of metals can be obtained with cold method thus propelling the growth for global cold forging machines market. Moreover, rising implementation of computer-aided designing (CAD) helps in reducing the time and cost in manufacturing process, which is further boosting the demand for hybrid forging techniques. This is likely to accelerate the adoption for cold forging machines in the near future. The global cold forging machines market is anticipated to expand at a CAGR of 5.2% during the forecast period, and is expected to reach value of USD 1.44 by 2024. Based on geography, Asia-Pacific is the dominating region and accounted for 56% revenue share of global cold forging machines market in 2016. Growing infrastructural development and automotive industry in developing and developed nations is contributing in the growth of forging industry, ultimately contributing in the expansion of cold forging machines market in Asia-Pacific region. Emerging manufacturing and automotive industries in countries such as China and India are propelling the demand for cold forging machines market in Asia-Pacific region. Mature manufacturing and automotive industry in countries such as Germany, Bulgaria, Finland, France, Hungary and other countries of European Union is fuelling the growth for cold forging machines market in Europe. Europe cold forging machines market valued USD 0.20 billion in 2016 and is projected to grow at a CAGR of 6.0% during the forecast period. Whereas, North America cold forging machines market is projected to reach value of USD 0.27 billion in 2024, owing to the expanding manufacturing industry in the region. Cold forging machines provides high accuracy and helps in obtaining simple shapes with high volume. 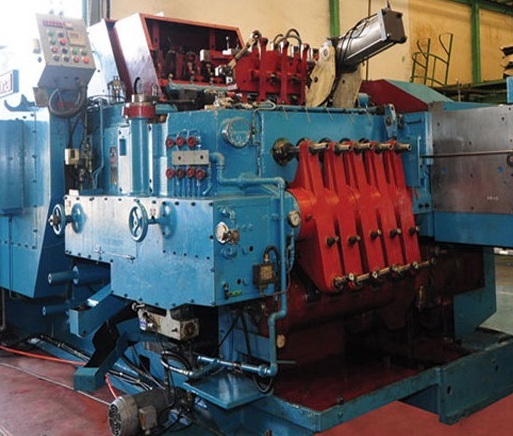 Cold forging machines helps in achieving the maximum utilization of raw material by volume. Cold forged component with lightweight shows excellent mechanical properties. Light weight design of material also helps in reducing material usage, cost and energy utilization required for manufacturing process. However, iron and steel are always hot forged and helps in preventing the machine operation on material. Hot forging is more economical for iron and steel than cold forging. Also, less ductile property of cold forged metals makes it inappropriate to meet specific customized configuration and heat treatments is necessary for cold forged metals to eliminate cracks. This is likely to impact the adoption for cold forging machines in the near future. Jern Yao Enterprises Co., Ltd.
Ningbo Sijin Machinery Co. Ltd.
Zhejiang Dongrui Machinery Industrial Co. Ltd.
Wuxi Zhengyao Machinery Co., Ltd.